What Does Executive Support Look Like | Fulcrum ConsultingWorks Inc.
Executives have limited time, but they are expected to support every effort. Rebecca explains five elements of effective executive support. 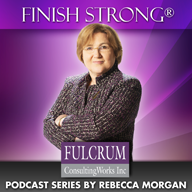 This entry was posted in Podcast Series: Finish Strong® and tagged executive support by Becky. Bookmark the permalink.